The San Pedro Town Council (SPTC)has embarked on a pilot project where by 35 new taxi permits have been issued with revised regulations for the year 2014. The ultimate goal of the pilot project is to regulate parking on Barrier Reef Drive, Pescador Drive and Angel Coral Street in an attempt to alleviate traffic congestion on the island. The new regulations will be administered and controlled by the SPTC. The taxi permit will grant the driver the right to own a taxi, but if the driver does not meet the standards and regulations set by SPTC, the permit will be revoked. Mayor Daniel Guerrero stated that discussions have been made with the taxi federation regarding the new regulations and improving vehicular traffic on the island. 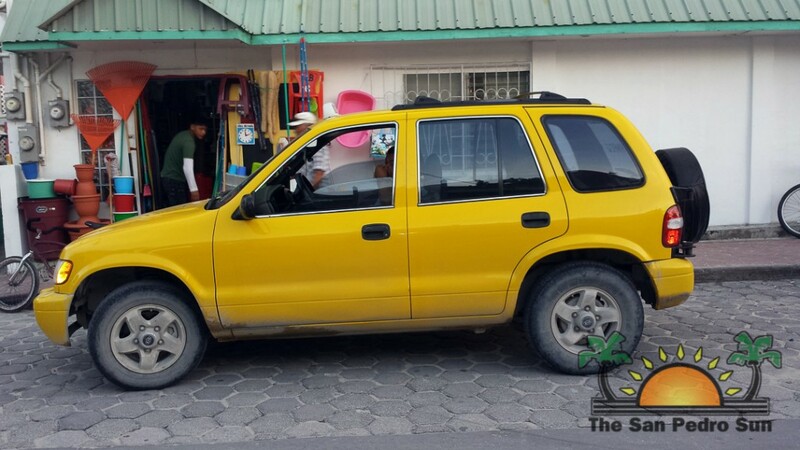 “The SPTC will be lobbying with the taxi federation to improve taxi services for San Pedro,” said Guerrero. One of the most prominent regulations that will be enacted is that all taxi vehicles must be painted yellow and display a taxi sign on top of the vehicle. These new regulations are being implemented to have uniformity so that taxis can be properly identified by the public. Each taxi union will be identified by a different color trim painted around each taxi cab. Apart from the color, vehicles will also have a set size limit. With the new taxi regulations, taxis must not exceed 166.5 inches in length and 68.3 in width. “Both the SPTC and the taxi federation are against the increase of more taxis on the island, but as part of the Pilot Project, the SPTC also wants to downsize the vehicles. This would reduce traffic congestion and help address parking issues. The new taxis that are being brought to the island are smaller and more compact to meet the new regulations. 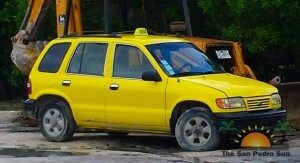 Eventually we aim to replace all existing taxis with these new smaller vehicles,” said Guerrero. Once the large taxicabs that are already on the island cease functioning, they must be replaced by a smaller vehicle in accordance with the new regulations. A special public relations workshop is also being organized for all taxi drivers to improve on customer service and proper etiquette when dealing with clients. The workshop will be officiated by The Belize Tourism Board (BTB). Apart from providing good customer service, taxi drivers will also be obligated to dress professionally while in service. BTB will be providing uniforms for all taxi drivers that attend the workshop. Anyone applying for a taxi permit must be a Belizean and speak fluent English. “The SPTC will provide all taxi drivers with an identification card that must be displayed at all times. A police record will also be requested when applying for a permit. Taxi drivers will also be required to improve their spoken English - because we are in a tourism destination and our official language is English,” said Guerrero. The SPTC reiterates that it reserves the right to retract the permit if the regulations are not met. All taxis will be carefully inspected before the permit is given. The SPTC reminds the public that this is a Pilot Project and in order to be successful rules and regulations must be followed. All motorists are encouraged to drive with caution during the Christmas season, and to refrain from driving while drinking. The SPTC Traffic Department wishes everyone a safe and happy holidays.